I learned to swim as a wee one from my dad, who didn’t really swim himself, but was tall enough and encouraging enough to send me back and forth to the side of a pool. There were also the terrifyingly wonderful trips on his shoulders out into crashing ocean surf, which instilled in me a fear and respect for the rising and falling, tempestuous beast, on whom he repeatedly admonished us kids to never, ever turn our backs. How could I, a small child with a giant dad, not also fall in love with this even more massive ocean, into which he so fearlessly ventured? The affair began with the Pacific Ocean, whose ill-tempered, icy waters off of Washington’s coast I have known since infanthood; by the time I turned eight, our bond was solidified: I had explored her warm, colorful reefs and pools off Fiji and Hawaii. What could be better? Beginning at age seven, I spent a few years swimming competitively on a local Seattle swim team. I learned the four strokes, how to swim laps and do a flip turn, how to dive from a block and compete in meets. To this day I’m not sure why I stopped. 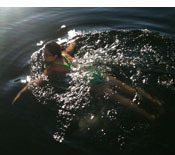 I suppose as a twelve-year-old, “I don’t feel like swimming so much,” was reason enough. Aside from the occasional lap swimming for pleasure, and a few years of SCUBA obsession as a teenager, I didn’t really swim regularly again until I was in college, at which point I also became a lifeguard and swim instructor. Although an exhausting job, I happily taught swim lessons in Seattle for Safe N Sound Swim School, and then in Manhattan for Take Me To The Water when I first moved to New York in 2003. For the past 7+ years I have been working on dry land as an educator at a small Quaker school for students with Learning Disabilities in Brooklyn. In late 2009, I joined the Brooklyn Triathlon Club, and began swimming with a local Masters program. Masters quickly became my favorite part of training for triathlons. After a season of Sprint and Olympic distance tris, I realized that my real love was still swimming, and a triathlete who is a proficient swimmer is really wasting her time if she spends too much of it training for the swim. So in January of 2011, I signed up for a 10-mile lake swim in Vermont in July, and a long distance open water swim training program in Malta in April, and got to training (and blogging about it). It was a great first season of open water swimming, during which time I came to know and love my open water swimming community, the CIBBOWS. I found myself with some relatively serious shoulder issues that led to surgery in the fall of 2011, but was back in the ocean by January. After a first season of winter ocean swimming, I am getting ready for another great summer of swims, including a 15.7 mile swim from the Tappen Zee Bridge to the George Washington Bridge on the Hudson River (part of the 8 Bridges Swim series), and a 2-person Ederle relay (17.5 miles from the Battery to Sandy Hook, NJ). Assuming all goes well with the shoulders this year, I hope to begin training for longer swims in 2013, including a solo Ederle swim and a swim around Manhattan. I haven’t been at this too long, but I am learning a lot from my experiences in NYC and around the world, and the inspirational, legendary swimmers I have come to know along the way. I recognize that what I am learning is the kind of stuff that any new open water swimmer has to learn, so I figured it would be nice to share. I hope you enjoy reading. Afterthought: While my first love will always be the Pacific, now that I am living and working in New York, I have fallen hard for the Hudson River and Atlantic Ocean. The Pacific is warm. It’s big, it’s inviting, it’s blue. The Mediterranean is a dirty bath. The Atlantic is brutal, punishing, mean and grey and it will steal your soul. I found your blog today –it’s great and I like the way you write. I’ll be following your posts and your swimming — good luck! How funny! I almost went to Malta in April this year to learn how to swim for a looooong time, also. But, sadly, I couldn’t get the days off of work. Wonderful photos! I am a watercolor artist and would like to use your green frog photo as a reference photo for a small part of a painting about our local wetlands. Is that okay with you? Of course! Thank you for getting in touch. I’d love to see the final painting. Thank you so much for posting. As someone with a low cold threshold, I am beginning to challenge myself by staying in the water. I went in the ocean a lot as a boy in RI, and drifted away from it in adolescence. I turned 33 this summer, and a good friend of mine really pushed me to jump back in again. The water temperature has been delightful as of today (Oct 2). But my goal is to go in year round. Unlike you, I am NOT a strong swimmer- most of my water play consists of flopping about, which is cool because the ocean is the only place that I can get away with acting like a total goofball. I find your blog so beautiful!! It really made me happy to read it. So… any winter swimming tips for a not-so-good swimmer? It’s great to read your posting. I am rally inspired by your passion & love for swimming. as a person who is stepping forward from just enjoying swimming to being passionate or crazy about swimming, I like to read your story and will come back here to motivate me again if I am again away from swimming world.